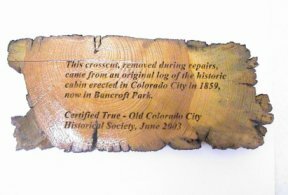 Dr. Garvin's 1859 log cabin that today sits in Bancroft Park on the westside of Colorado Springs has had many lives. 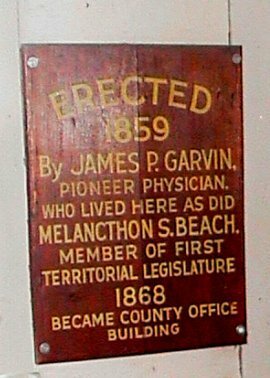 First of all it was built by Melancathon Beach and Dr. James Garvin the same year Colorado City was founded – 1859. Its original location, where it stayed from the day it was built until 1929 is today’s 2508 West Colorado Avenue. Garvin went back home to Illinois in 1866. We heard nothing more about him until his great granddaughter contacted us after seeing our History Center web site, and filled in what he did later. 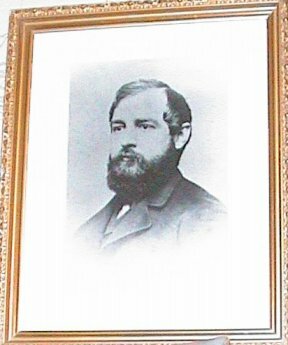 She provided us a good portrait of him that now hangs in the cabin.” Garvin’s great, great grandchildren saw the cabin for the first time in 2007. In 1868 after Arapahoe Indians attacked settlers and the young Robbin’s boys – 8 and 12 – were killed in the Shooks Run area, and 17 year old Charlie Everhart was killed, all three scalped and mutilated bodies were laid out in the Cabin, which made it a temporary morgue. 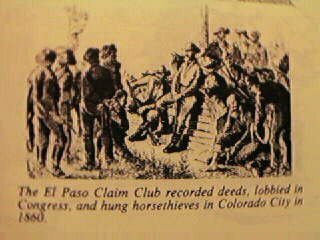 In 1868 also Irving Howbert, having been elected El Paso County Clerk and Recorder asked the County Commissioners to rent the Cabin as the County Courthouse. He complained that his current office was so cold the ink froze, and he couldn’t work. They agreed. 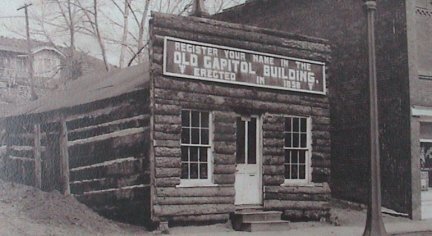 Until 1871 the Cabin was a busy, and cozy, county office building. 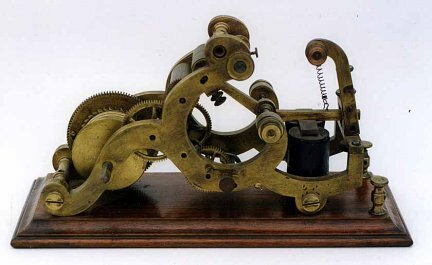 It even sported the first telegraph instrument in all El Paso County, connected it to Denver. When General Palmer first arrived in 1869, he went into that Cabin, saw that Howbert was a bright young man who knew who owned all the property in the County. He used Howbert as the front man to buy up the land that became two years later, Colorado Springs. Palmer also had to bring his own telegrapher with him, because Irving did not have the skill to send morse code, even though, being a very early instrument that could print out the dots and dashes on a paper strip, he could decode those and write down the messages. The Cabin was very busy after people started arriving in Colorado Springs and had business with the County. By 1872 Colorado Springs decided tried to take the County Seat away from Colorado City, by election. 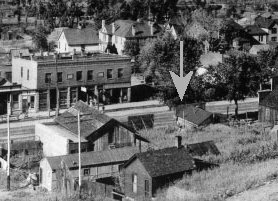 The first vote failed, but the alarmed Commissioners, seeing the handwriting on the wall, hastily built a new two story ‘Court House’ in what was named ‘Courthouse Square’ which is now Bancroft Park and vacated the cabin. They were in such a hurry they forgot to build an out house! 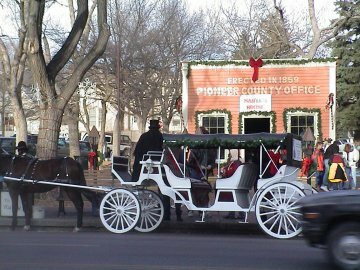 Colorado Springs suceeded in 1873. The ‘Garvin’ Cabin reverted to just being a low rent place with a stone fireplace where a series of families lived. 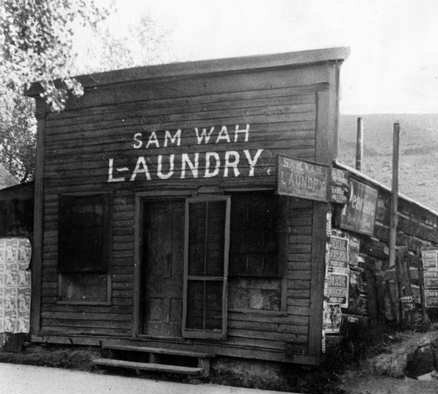 In the 1880’s Sam Wah turned the cabin into ‘Sam Wah’s Chinese Laundry. It also was an opium den which got him into trouble with the town Marshal. That use lasted until 1913 when Colorado City voted dry and all the saloons and sporting houses shut down. It stood vacant for many years. In 1924 it housed a company making and selling ‘Capitol Crispettes.” In 1925 a Mrs Ida Hendee, with a big sign on the false front announcing it as the ‘First Territorial Capital’ turned it into a tourist attraction. But by 1926 it was in danger of being torn down to make room for another structure. Thayer Tutt Jr who had been told by his father since he was young that the cabin was “The most important building in all El Paso County” bought it in 1927 for $40. He had it moved and placed on the Broadmoor Golf Course as a historical decoration! They put garden hoses in it. I remember seeing it there in a copse of trees between the 18th and 19th greens, when I was a boy caddying for my uncle, in 1934. Then came the 1959 ‘Rush to the Rockies’ Centennial, centered on Denver. The Broadmoor gave the Cabin to the State Historical Society. 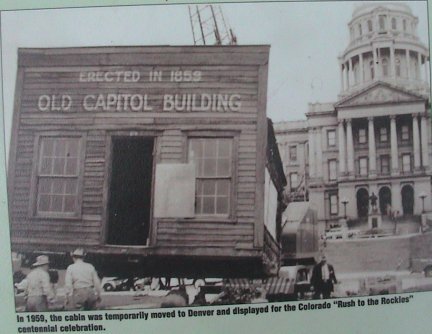 Local men such as Kenny Englert and George Cross, with Labor Union volunteer help, moved the Cabin, intact, on a flat bed trailer to Denver, where it sat on the grass below the State Capitol right on Broadway. 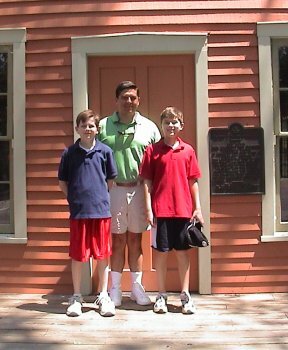 It was staffed as a tourist information center during the Centennial celebration year. But the 1960 Legislature refused to fund the one person who would staff the Cabin. Others thought the scruffy small log thing marred the elegance of the State Capitol Grounds. So the state gave it to the Pikes Peak Historical Society for return to its place of origin. 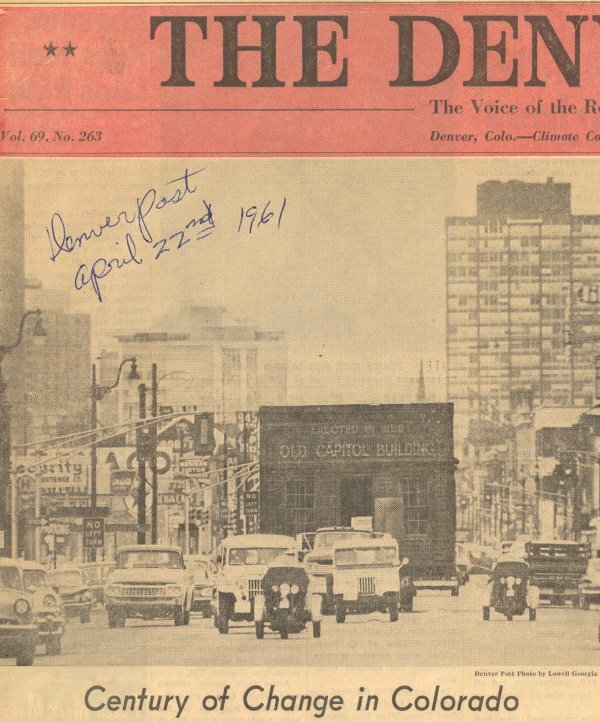 In April 1961, the local Historical Society men arranged for the Cabin to be brought back with fanfare - a police parade through downtown Denver and be donated to the City of Colorado Springs, placing it in Bancroft Park, where it rests today, its third and final location. For 15 years it just sat there in run down Bancroft park, deteriorating and neglected even by the city. Dave Hughes as the Chairman of the Pikes Peak or Bust by ’76 Centennial committee persuaded Thayer Tutt through El Pomar, to pay for needed repairs. That was done in 1977 at a cost of $7, 590. The city then fixed up the park. 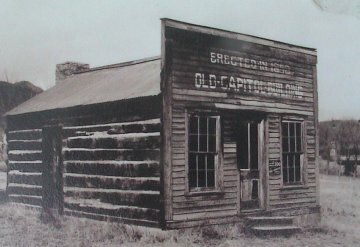 The 1859 Garvin Cabin thus became an integral part of the Historic Restoration of Old Colorado City. For the next 25 years the Garvin Cabin was intermittently open and displayed, especially during Annual Territory Days and at Christmas when Santa sat inside and children were photographed by the Business Association. It took a beating from such use. Water splashing on the lower logs from the flagstones caused more deterioration. The City begged off for budgetery reasons to repair it, and refused to ask for a State Historical Fund grant, because the Tabor Amendment would not permit the city accepting a grant without lowering their own city funds the same amount. So the Old Colorado City Historical Society came to the rescue. It became the grant applicant and administrator, to whom the Tabor government rules did not apply. The City provided a 25% dollar match however, and the city owned cabin was rehabbed extensively once again – for $91,290. The whole cabin had to be lifted and set aside during extensive repairs. It should last for another 50 years. The bottom original 1859 logs that had to be replaced were saved by the History Society. They have been sliced, polished, engraved, numbered and certified. And they are sold for $25 each as Colorado City historical memorabilia. 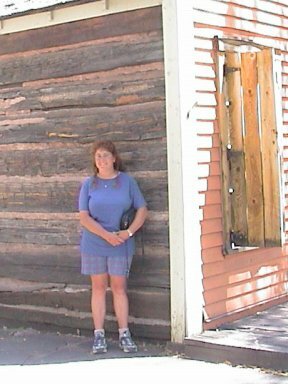 So the 1859 Cabin of many lives, kicked around politically, with old time furnishings inside, open on occasion, still works its log cabin magic on the minds of visitors who can better visualize how and where people lived in the Rocky Mountains long ago. Great, great, great niece of Melanchon Beach, town founder and builder of cabin with Garvin. About 2003. She unlocked the secret of where his tongue twister of a first name came from - "Oh that's easy she said. His mother was German, and named him after a disciple of Martin Luther - Melancthon!" Only because of this web site, since 1997 have we been contacted by descendents of the earliest Colorado City pioneers, like the Garvins and the Beach's.